The Zephyr Sectional is our most contemporary modular seating option featuring 94” and 70” armless components joined at a soft angle. The 26” deep seat depth, in combination with the low plush back, make this sectional perfect for both formal and casual seating. 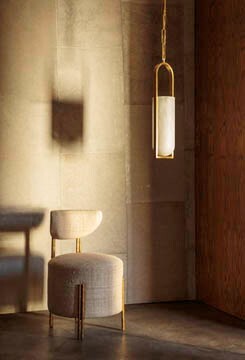 The cast brass legs exhibit a hammered texture that give the piece a hand-wrought component. The hardwood frame is double-doweled with 8-way hand-tied springs for longevity and performance. Available in a selection of curated fabrics and leathers. Available in right and left facing options.